In today's VetGirl blog, we interview Dr. Bill Bush, DACVIM (Neurology) of Bush Veterinary Neurology Services on his favorite anti-convulsant to use in veterinary medicine. So, why keppra, a newer anti-epileptic drug, instead of phenobarbital or potassium bromide? Is it effective? How expensive is it? Should it be my first choice drug for my epileptic patients? Dr. Bush discusses some of the pros: the generic version of the extended release product (making it cost-effective) and its minimal side effects (e.g., aside from sedation, ataxia, etc.). 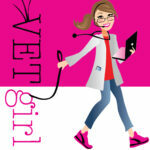 Check out this VetGirl blog to learn if you should be using it! Great! Will give it a shot for the very next seizure dog that comes in. What’s the best way to switch to Keppra as a monotherapy from phenobarbital or potassium bromide? Any anecdotal advice? Work up to it means gradually increase the dose to control the seizures but ideally use the lowest effective dose to control (< 1 seizure q. 3 months, as a goal). My take away- start using Keppra in an emergency setting on that seizuring or cluster dog either IV @60mg/kg – what is the SQ dose? Same?